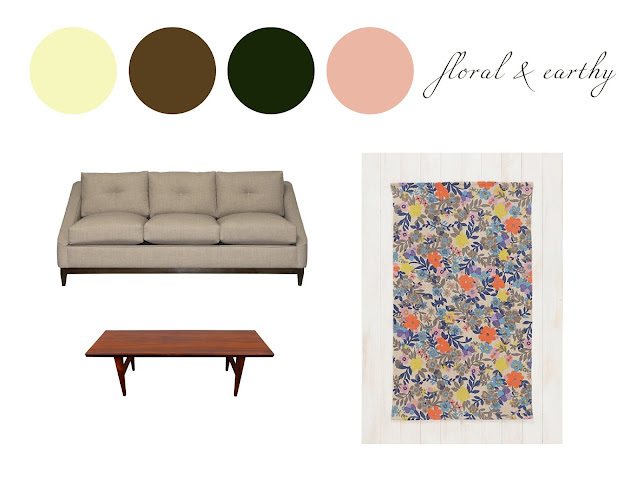 We continue our makeover of Cindy's living room by getting into more design details and budgeting. Check out each step of the process so far: Initial Survey, Plan Schemes, and Style Diagnosis. There are a few things that Cindy wants to make sure works well in the chosen plan scheme below. Firstly, there should be enough comfortable space to walk behind the couch and secondly, the TV above the fireplace should not be so high that it strains the neck of those watching from the couch. For the plan and section above, I used furniture from Junette's Bold and Classic option as the drawing base because both the couch and the rug dimensions are the largest of the three options. Issue One: The walkway behind the couch is the main circulation path from the front door to the dining room, kitchen, and bedrooms. 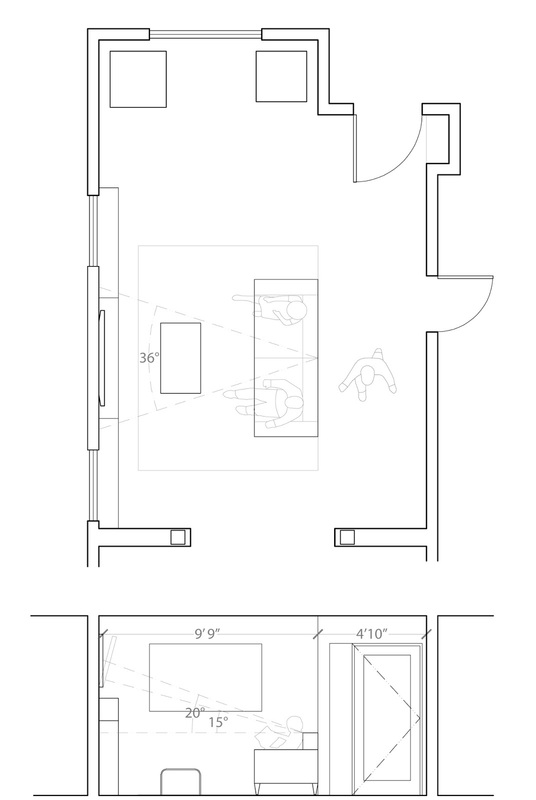 Cindy's bedroom is also located directly off of the walkway so it needs to be wide and unobstructed. The couch is currently aligned with the wall by the front door and nook area. This allows the walkway to be 4 feet 10 inches wide which is very comfortable for the average person. For your reference, the minimum width for any household hallway or stairway is 3 feet, which is also the dimension for handicap requirements. Issue Two: By moving the TV above the fireplace, it sits 4.5 ft above the floor. The viewing angle becomes a concern because the TV is now so high. I checked movie theater and home theater standards and THX recommends the horizontal viewing angle to be within 36 degrees. For the vertical viewing angle, the viewer's sightline should be between 10-20 degrees of the centerline of the screen, 15 degrees being the optimal angle. The design is slightly shy of the perfect 15 degree viewing angle, so we recommend Cindy to get a TV tilt mount which will allow her to adjust it to her preferred angle. While I was checking the viewing angles, I came across some viewing distance recommendations. Wiki has a list of TV size to viewing distance ratios that are pretty handy. Cindy has a 42" TV so the range for viewing distance is between roughly 5.5 feet and 10.5 feet. At around 9 feet, our setup falls within the optimal viewing distance. The tricky part of re envisioning this living room is that Cindy wants to invest in good pieces but still stay within her budget. The walls are painted light yellow with white trim, and Cindy did not want to change the color, so I came up with three color schemes and coordinating pieces. Of course, the color schemes are flexible and actually many of the pieces are interchangeable. We'll see how things really go down once we test out sofas, because I think that will help indicate which general direction Cindy will decorate her living room. I think it would be best to use two phases of decorating in order to accommodate Cindy's budget and to take a step back to see what works/doesn't work. Phase II is mostly about arranging the nook in front of her side window. It's visible, but not a huge priority in terms of everyday use. 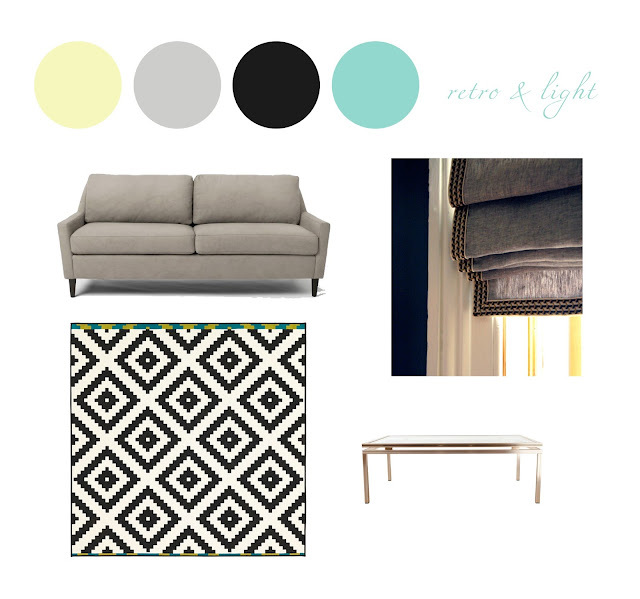 The first color scheme is nice and light, with mostly neutrals and a bright pop of teal. I see this West Elm sofa in gray performance velvet or linen coming together nicely with gray shades and a vintage coffee table such as this one. 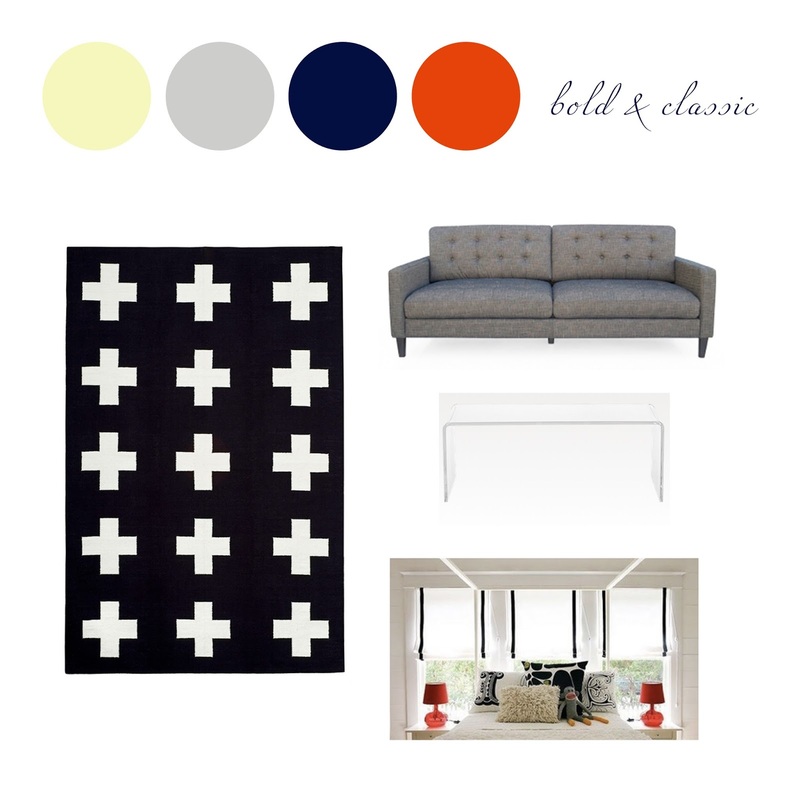 I really love this Ikea rug, and I think it would create a fun and young vibe to the space. The next color scheme has more bold, modern colors, but it's still classic red-white-and blue. I love a good dark blue and orangey red. Orangey red is far superior to red-red!! Every time I go to Urban Home, I try out their sofas, and I'm convinced they are pretty good quality, so I definitely think we should test out this sofa. I saw this rug a few weeks ago on Design*Sponge and I have been just waiting to show it to Cindy. Finally, I really really love this modern coffee table, and I would swoon if Cindy picked it! Oh, and I'm pretty sure DIY roman shades are the way to go, but in this case, they would be white with blue or red trim. Finally, we have an earthy toned color scheme, that I think would be really warm and inviting. I think the Sofa Company has some great choices, and I think this sofa in khaki or hunter green would be a really stunning and yet comfy sofa. I know this rug might seem a little too literal, but hear me out! If we keep the sofa, shades, table relatively plain, we need this rug to add a little boogie woogie to the room. Please oh please someone make me a dress out of this rug (a la the Von Trapps). Oh, and the table would be a classic vintage buy, and I have definitely seen one just like this one (secret location!). Can't go wrong with those legs!